A Strathclyde Student won a prestigious international undergraduate award. Melissa Alexander, who studied English Literature, was the winner in the Literature category of the Undergraduate Awards 2015, which aim to identify creative thinkers through their coursework, providing top-performing students with support and opportunities. Melissa’s paper examined why people enjoy reading, and what it is that results in it being an absorbing experience for them. Melissa was one of only 25 winners, with a total of more than 5,100 submissions from undergraduates in 39 different countries. She received her award at the global summit for the awards in Dublin from President of Ireland, Michael D. Higgins. 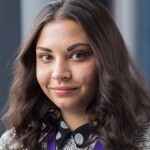 “The entire faculty of English at Strathclyde has been incredibly helpful and supportive, always ready to take the time to discuss new ideas with me and encourage me in my interests. Melissa is now studying a Literature, Culture and Place Masters at Strathclyde.